By race 2 in this 4-race series, things always start to get interesting. Individuals committed to achieving particular outcomes rock up with a keen eye for their competitors. Tactical decisions are made according to working the point system, and the finish line becomes an exciting place to watch it all unfold. The route offers a classic mix of exciting single track, forest paths and fynbos studded trail through orchards and playful switch backs. The race village area looks over an inviting dam, and as temperatures rose during the morning, more than a few runners had a splash before heading home. The 13.4km long course was once again stacked with speedy potential. Siviwe Nkombi, winner from Race 1 at Kirstenbosch the Tuesday prior, took an early lead. Hot on his heels were Peter Tsawayo and Emmanuel Dlamini. Word from the course was that these three, as well as Lucas Adams, left absolutely everything out there as no one gave an inch. It was only in the last 3km that Nkombi shook his rivals, taking the win in a time of 52min42sec. Tsawayo followed in 55min32sec, with Dlamini taking third in 57min17sec. Adams came in some 2 minutes later in fourth position, with high praise for the three men ahead of him. The finish line was a hive of activity with the winners tape switched swiftly to the short course chute in the midst of the racing action. Rob Tweddle took the 6.3km course in just 25min47sec, with first woman and second overall, Bianca Tarboton 2 seconds behind him. The couple raced the small hill to the finish in an entertaining, all-out effort which could have gone either way. Jaco Loots was second man across the line in 26min31sec, with 14 year old Deon Bochnig rounding out the podium in 27min07sec. Second woman in the short course was Tyra Buncombe in 31min13sec, and third spot was taken by Carey Pike in 32min29sec. The food and coffee trucks did a roaring trade as the crew settled in for prize giving and the highly anticipated lucky draw loot. There was much chat about Race 3, the next sunset run at Meerendal on 30 January. Prizes courtesy of Jaybird, Boldgear, North Ridge, Hydro Flask & Petzl as well as unique Wildrunner branded kit were well received by those who made a morning of it. Superb race images by Mark Sampson and Franz-Erich Streicher have been loaded to the Trail Series® Facebook page. Online entries for Race 3 and 4 are open! 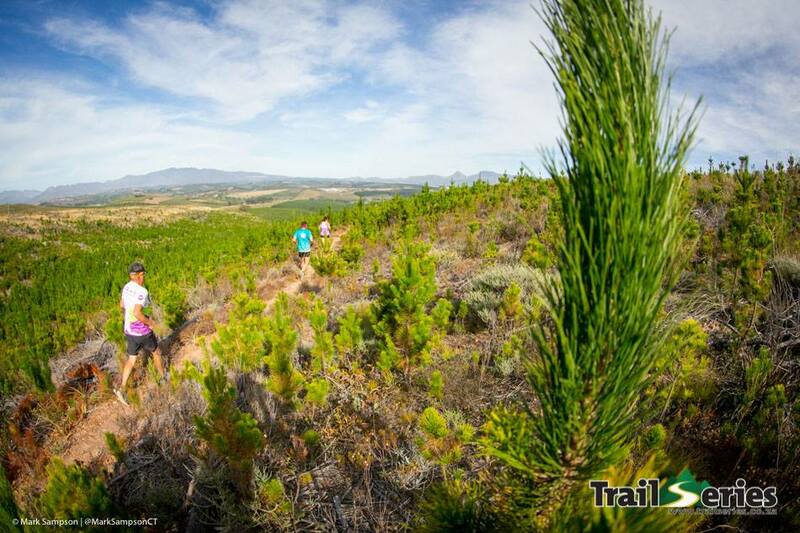 www.trailseries.co.za for more info - and remember that kids 10 and under, if pre-registered, will run at no cost. Apply for their discount code by emailing info@wildrunner.co.za. Now in its 11th consecutive year, Wildrunner’s popular Trail Series® continues to deliver a top quality, accessible and thoroughly enjoyable trail running experience for every level of runner. This year, the series final on the picturesque trails of the Kogelberg Nature Reserve was a fitting end to one of the best series yet. On Saturday 11 August, the sleepy town of Kleinmond was bustling by 7 am. With the mountains of the biosphere looking down, the start/finish area above the beach filled up with families, friends, arch rivals and their supporters. At 8:30 am, the XL Course runners set off. A field of more than double the 2017 intake enjoyed 23km of rolling single track, boulder hopping, boardwalks, big climbs and one of the best Protea displays in this event’s history. At 9:15 am the long course went off in 4 separate batches. The diverse route covered 14km, with coastal pathways, forests and mountain trails complete with spectacular ocean views. The short course crew followed at 9:36 am, to take on their 8km version of the event. No less beautiful, and a fair challenge for many. It was only 32 minutes and 5 seconds before junior runner Stephen Millard came flying down the finish chute. Stephen, who has battled some niggles in both knees throughout the event, placed 2nd behind Ryan Ball in each of the previous three events, but put it all out there in Kleinmond to take top spot. In the women’s race, the crowd was on their feet cheering a sprint finish between Nicola Wills and Tanya Posthumus-Fox. Nicola finished in 38min 26 seconds with Tanya just behind her. There was impressive racing in the PeeWee and MiniMee categories, right through to the Grand Masters for the both men and women. In the long course, Emmanuel Dlamini stormed home in 1 hour, 7 minutes and 51 seconds, securing his outright win of the Championship Series. First woman home was Katya Soggot, 8th overall in a time of 1 hour, 16 minutes and 34 seconds. The XL course was won by Italian Stalian, Andrea Biffi in 1 hour 58 minutes and 51 seconds. First woman, and 5th overall, was 21 year old Bianca Tarboton in a time of 2 hours 21 minutes and 18 seconds. As the runners poured in off the mountain and the festivities on the finish line leapt up a notch, there was much banter about who had placed were in the final series results. For many, however, their positions were not as important as the experiences that each event had brought. Some took home trophies, others scooped big prizes in the lucky draws. Some just came for the Instagram shots – and they certainly got those! From the rollercoaster ride at Paul Cluver Estate to the daunting climb at Tygerberg; the granite boulders of Paarl to the ocean views of Kleinmond, the Cape Winter Trail Series® unearthed new talent, created new friendships, reignited the pure joy of running and brought young and old in to some of the Cape’s most beautiful outdoor spaces. With thanks to partners Raidlight South Africa, Jaybird, Steenberg, and Pepsi for another grand adventure. We only part to meet again! 11 years in, and the magic just keeps building. Every year a combination of familiar faces and brand new recruits arrive at the Trail Series® venues, each with their own objectives. Some come to test their legs at their very first trail race, others come to enjoy the social aspect of a short of medium distance trail with friends. The fast pack get out there to kick up the dust, and every year a few new trail stars are born. With Race 1 and 2 already in the bag, the 2018 Cape Winter Trail Series® has been no different. On Sunday 22 July a capacity crowd streamed in to Paul Cluver for either the 15.5km long course, or the 8.6km short course. With some exciting route changes since 2017, both distances proved a balanced combination of challenge, reward and fun. Over hot pancakes and breakfast burgers, the post-race stories emerged. Who is Cana Peek? The young Stellenbosch student who was first spotted winning the JMC 24km earlier this year, took top spot on the long course and has reportedly won every trail race she has entered between the two events. Ryan Ball, in the junior category, cruised ever so easily to victory in the short course. Both Cana and Ryan are runners to watch. The Mini Mees and Pee Wees chatted and laughed over cups of Pepsi before prize giving; far cry from the fierce competition they throw down on the short course. The youngsters marvelled at the Grand Masters. The amphitheatre was packed for prize giving. Raidlight gear, Steenberg Wine and the highly coveted Jaybird Bluetooth earphones in the lucky draw mix. You don’t have to be a podium runner to leave feeling triumphant. “See you next week!” as cars streamed out, taking sweaty, satisfied runners and their crew home. Not a sniff of the Monday blues about. On Sunday 29 July a similar crew climbed the grassy bank to line up for Race 2, at Tygerberg Nature Reserve. This hidden gem of a space is not widely known to many, and it holds plenty of well-kept secrets. As the sun rose, the full moon hung low and heavy next to Table Mountain on the horizon. Runners peeled off their layers, sipped hot coffee and prepared to do battle. And a battle it was, with a tougher course than Race 1, and far, far more climbing on the menu, but no less fun. The fast pack had to fight a little harder for their positions, but Cana Peek did not disappoint her new fan club, coming in second overall in the long course, and first woman. Marion Leiberich was hot on her heels, only a minute separating the two woman who were 2nd and 3rd across the line, behind Emmanual Dlamini. Ryan Ball also had to fight for first spot in the short course, with fellow junior runner Stephen Millard only 31 seconds behind him. Some cat and mouse racing up on the trails of Tygerberg. A festive atmosphere above the finish chute rounded out another day of winter trail magic. Good food, great tunes and endless laughter as the crowd hung around to bring the very last runners over the line. Next up is the Taal Monument on Sunday 5 August. Race 3, and the fastest course of the lot.